Armstrong, Karen. Fields of Blood (Anchor; Reprint edition, 2015). In these times of rising geopolitical chaos, the need for mutual understanding between cultures has never been more urgent. Religious differences are seen as fuel for violence and warfare. In these pages, one of our greatest writers on religion, Karen Armstrong, amasses a sweeping history of humankind to explore the perceived connection between war and the world’s great creeds—and to issue a passionate defense of the peaceful nature of faith. With unprecedented scope, Armstrong looks at the whole history of each tradition—not only Christianity and Islam, but also Buddhism, Hinduism, Confucianism, Daoism, and Judaism. Religions, in their earliest days, endowed every aspect of life with meaning, and warfare became bound up with observances of the sacred. Modernity has ushered in an epoch of spectacular violence, although, as Armstrong shows, little of it can be ascribed directly to religion. Nevertheless, she shows us how and in what measure religions came to absorb modern belligerence—and what hope there might be for peace among believers of different faiths in our time. New Postscript in paperback deals with IS and the events in Paris January 2015. Armstrong, Karen. Muhammad: A Prophet of Our Time (HarperOne, 2007, reprint). Muhammad presents a fascinating portrait of the founder of a religion that continues to change the course of world history. Muhammad's story is more relevant than ever because it offers crucial insight into the true origins of an increasingly radicalized Islam. 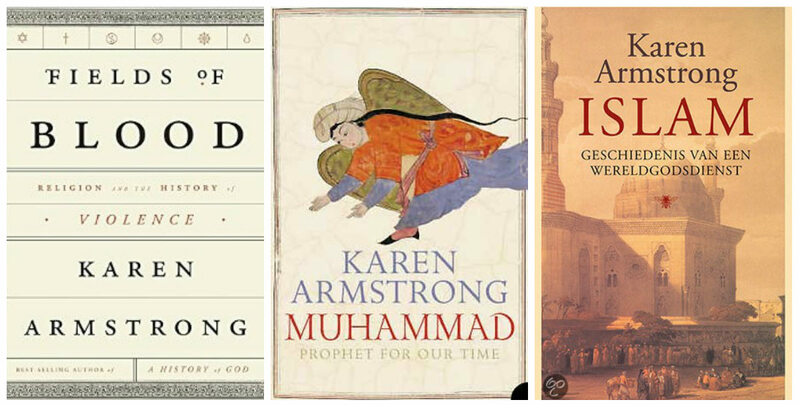 Countering those who dismiss Islam as fanatical and violent, Armstrong offers a clear, accessible, and balanced portrait of the central figure of one of the world's great religions. Armstrong, Karen. Islam: A Short History (Modern Library, 2002, reprint). Aslan, Reza. No god, but God (Ember 2012). For teens and young adults. An invaluable introduction for young readers to a faith that for much of the West remains shrouded in ignorance and fear. Written by Reza Aslan, an internationally acclaimed scholar of comparative religion, No god but God examines Islam: its rituals and traditions, the revelation of Muhammad as Prophet and the subsequent uprising against him, and the emergence of his successors. 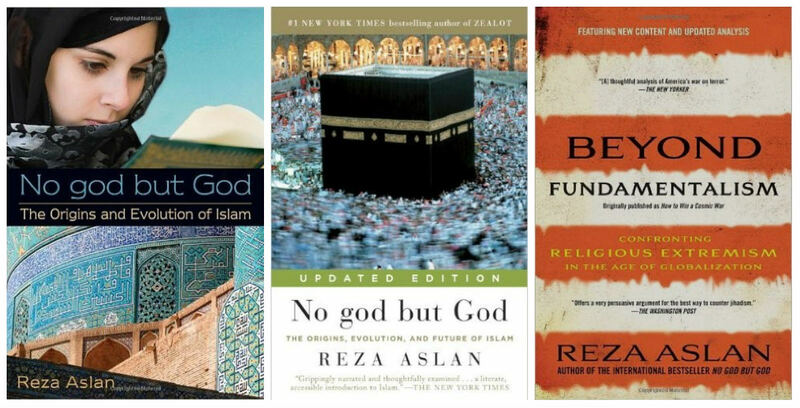 Engaging, accessible, and thought-provoking, No god but God is sure to stimulate discussion and encourage understanding of the Islamic faith and the people who follow it. Aslan, Reza. No god, but God (Random House, 2011). Aslan, Reza. Beyond Fundamentalism: Confronting Religious Extremism in the Age of Globalization (Random House Trade Paperbacks; 2010). Beyond Fundamentalism is both an in-depth study of the ideology fueling al-Qa‘ida, the Taliban, and like-minded militants throughout the Muslim world and an exploration of religious violence in Judaism, Christianity, and Islam. At a time when religion and politics increasingly share the same vocabulary and function in the same sphere, Aslan writes that we must strip the conflicts of our world of their religious connotations and address the earthly grievances that always lie at its root. Esposito, John L. Islam and Democracy After the Arab Spring (Oxford University Press, 2015). The landscape of the Middle East has changed dramatically since 2011, as have the political arena and the discourse around democracy. In Islam and Democracy after the Arab Spring, John L. Esposito, John Voll, and Tamara Sonn examine the state of democracy in Muslim-majority societies today. Applying a twenty-first century perspective to the question of whether Islam is "compatible" with democracy, they redirect the conversation toward a new politics of democracy that transcends both secular authoritarianism and Political Islam. While the opposition movements of the Arab Spring vary from country to country, each has raised questions regarding equality, economic justice, democratic participation, and the relationship between Islam and democracy in their respective countries. Does democracy require a secular political regime? Are religious movements the most effective opponents of authoritarian secularist regimes? Esposito, Voll, and Sonn examine these questions and shed light on how these opposition movements reflect the new global realities of media communication and sources of influence and power. Positioned for a broad readership of scholars and students, policy-makers, and media experts, Islam and Democracy after the Arab Spring will quickly become a go-to for all who watch the Middle East, inside and outside of academia. Esposito, John L. The Future of Islam (Oxford University Press; Reprint edition, 2013). John L. Esposito is one of America's leading authorities on Islam. Now, in this brilliant portrait of Islam today--and tomorrow--he draws on a lifetime of thought and research to sweep away the negative stereotypes and provide an accurate, richly nuanced, and revelatory account of the fastest growing religion in the world. Here Esposito explores the major questions and issues that face Islam in the 21st century and that will deeply affect global politics. Are Islam and the West locked in a deadly clash of civilizations? Is Islam compatible with democracy and human rights? Will religious fundamentalism block the development of modern societies in the Islamic world? Will Islam overwhelm the Western societies in which so many Muslim immigrants now reside? Will Europe become Eurabia or will the Muslims assimilate? Which Muslim thinkers will be most influential in the years to come? To answer this last question he introduces the reader to a new generation of Muslim thinkers--Tariq Ramadan, Timothy Winter, Mustafa Ceric, Amina Wadud, and others--a diverse collection of Muslim men and women, both the "Martin Luthers" and the "Billy Grahams" of Islam. We meet religious leaders who condemn suicide bombing and who see the killing of unarmed men, women, and children as "worse than murder," who preach toleration and pluralism, who advocate for women's rights. The book often underscores the unexpected similarities between the Islamic world and the West and at times turns the mirror on the Us, revealing how we appear to Muslims, all to highlight the crucial point that there is nothing exceptional about the Muslim faith. Recent decades have brought extraordinary changes in the Muslim world, and in addressing all of these issues, Esposito paints a complex picture of Islam in all its diversity--a picture of urgent importance as we face the challenges of the coming century. This is an important book. Those of us who have been on the front line of the effort, since the atrocities of September 11, 2001 ,to explain Islam in the Western world soon became aware not simply of the widespread ignorance of Muslim religion in both Europe and the United States but also of an entrenched reluctance to see Islam in a more favorable light. People often look balked and vaguely mutinous when, for example, you explain that the Qur’an does not in fact advocate the indiscriminate slaughter of the infidel or the propagation of the faith by the sword, and that even though there is still much to be done to promote gender equality in Muslim countries, the message of the Qur’an was initially friendly to the emancipation of women. One of the most frequently asked questions is: ‘‘Why has Islam not had a reformation?’’ The query betrays an ignorance of both Islamic and Western history. It assumes that there was something special and unique about the reform movement initiated by Martin Luther (1483–1556) and John Calvin (1509–64) that points to the inherent superiority and progressive nature of our Western culture. In fact, Luther’s was a typical pre-modern reformation, similar to many of the movements of islah (‘‘reform’’) and tajdid (‘‘renewal’’) that have regularly punctuated Muslim history. They all, Muslim or Christian, follow a similar agenda: they attempt to return to the wellsprings of tradition and cast aside the piety of the immediate past. Thus Luther and Calvin sought to return to the ‘‘pure’’ Christianity of the Bible and the Fathers of the Church, in exactly the same way as Ahmed ibn Taymiyyah of Damascus (1263–1328) advocated a return to the Qur’an and the sunnah (‘‘customal practice’’) of the Prophet Muhammad. In his desire to get back to basics, Ibn Taymiyyah also overturned much revered medieval jurisprudence and philosophy, just as Luther and Calvin attacked the medieval scholastic theologians; like any Muslim reformation, therefore, their movement was both reactionary and revolutionary. Reform movements usually occur during a period of cultural change or in the wake of a great political disaster, when the old answers no longer suffice and reformers seek to bring the tradition up to date so that it can meet the contemporary challenge. The Protestant Reformation took place during the profound societal changes of the early modern period, when people found that they could no longer practice their faith in the same way as their medieval ancestors. It was, therefore, the product rather than a cause of modernization, and instead of being regarded as the instigator of change, Luther should rather be seen as the spokesman of a current trend. A similar process is now under way in the Muslim world, where the modernization process has been even more problematic than that of sixteenth-century Europe, because it has been complicated by the colonial disruption and continued Western influence in the internal affairs of the former colonies. Most important, Professor Esposito makes it clear that Western people simply cannot afford to remain uninformed about these developments in the Muslim world. He shows how the failure of Western foreign policy has been one of the causes of the current malaise in the region and that, for example, ignorance about the Sunni/Shia rift in Iraq made it impossible for the United States to identify friends and foes. We now live in one world and share a common predicament. What happens in Gaza or Afghanistan today is likely to have repercussions tomorrow in London or Washington, D.C. To persist in the belief that all Muslims support terrorism, oppose democracy, and are atavistically opposed to freedom is not only counterproductive to Western interests but, as we see in these pages, flies in the face of the evidence, such as that provided in the recent Gallup Poll. Westerners cannot expect Muslims to adopt a more positive view of their cultural values if they themselves persist in cultivating a stereotypical view of Islam that in some significant respects dates back to the Middle Ages. Unless we can learn to live together in a more just and rational way, we are unlikely to have a viable world to hand on to the next generation. One comes away from this book convinced that the future of Islam does not simply depend on the effectiveness of a few Muslim reformers but that the United States and Europe also have a major role to play. If short-sighted Western policies have helped to create the current impasse, they will, if not corrected, continue to have a negative effect upon the region, will weaken the cause of reform, and play into the hands of extremists. In the Qur’an, God calls all men and women to appreciate the unity and equality of the human race: ‘‘O people! Behold, We have created you all out of a male and a female, and have made you into nations and tribes so that you might come to know one another’’ (49:13). One of the major tasks of our generation is to build a global community, where people of all persuasions can live together in harmony and mutual respect. In writing this book, which will help many Western readers to achieve a more balanced, informed, and nuanced appreciation of the Muslim world, Professor Esposito has made a major contribution. Esposito, John L. What Everyone Needs to Know about Islam (Oxford University Press; 2 edition, 2011). Since the terrorist attacks of September 11th, there has been an overwhelming demand for information about Islam, and recent events - the war in Iraq, terrorist attacks both failed and successful, debates throughout Europe over Islamic dress, and many others - have raised new questions in the minds of policymakers and the general public. This newly updated edition of What Everyone Needs to Know about Islam is the best single source for clearly presented, objective information about these new developments, and for answers to questions about the origin and traditions of Islam. Editor of The Oxford Encyclopedia of Modern Islam and The Oxford History of Islam, and author of The Future of Islam and many other acclaimed works, John L. Esposito is one of America's leading authorities on Islam. This brief and readable book remains the first place to look for up-to-date information on the faith, customs, and political beliefs of the more than one billion people who call themselves Muslims. Esposito, John L. Who Speaks for Islam: What a Billion Muslims Really Think (Gallup Press; 1st edition, 2008). Kamali, Mohammad Hashim. The Middle Path of Moderation in Islam: The Qur'anic Principle of Wasatiyyah (Oxford University Press, 2015). In The Middle Path of Moderation in Islam, leading Islamic law expert Mohammad Hashim Kamali examines the concept of wasatiyyah, or moderation, arguing that scholars, religious communities, and policy circles alike must have access to this governing principle that drives the silent majority of Muslims, rather than focusing on the extremist fringe. Kamali explores wasatiyyah in both historical/conceptual terms and in contemporary/practical terms. Tracing the definition and scope of the concept from the foundational sources of Islam, the Qu'ran and Hadith, he demonstrates that wasatiyyah has a long and well-developed history in Islamic law and applies the concept to contemporary issues of global policy, such as justice, women's rights, environmental and financial balance, and globalization. Framing his work as an open dialogue against a now-decades long formulation of the arguably destructive Huntingtonian "clash of civilizations" thesis as well as the public rhetoric of fear of Muslim extremism since the attacks of September 11, 2001, Kamali connects historical conceptions of wasatiyyah to the themes of state and international law, governance, and cultural maladies in the Muslim world and beyond. Both a descriptive and prescriptive meditation on a key but often neglected principle of Islam, The Middle Path of Moderation in Islam provides insight into an idea that is in the strategic interest of the West both to show and practice for themselves and to recognize in Muslim countries. Patel, Eboo. 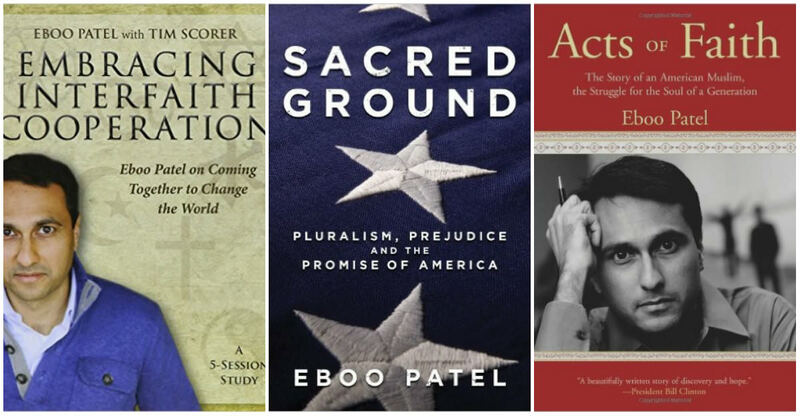 Embracing Interfaith Cooperation Participant's Workbook: Eboo Patel on Coming Together to Change the World (Morehouse Education Resources, 2013). Join interfaith commentator Eboo Patel as he explores what it means to be "literate" about other faiths, how interfaith cooperation "works" and why, the skills needed for interfaith cooperation and the significant role that our institutions, including colleges and faith communities, can play in this process. This resources contains all the material needed by class participants and the group facilitator. SOLD SEPARATELY. Embracing Interfaith Cooperation DVD. This resource features five 10-15 minute presentations by Eboo Patel, each of which is followed by video of Patel interacting with a small, diverse group of adults and young adults as they respond and discuss interfaith issues. Eboo Patel believes religion is a bridge of cooperation rather than a barrier of division. Inspired by his faith as a Muslim, his Indian heritage and his American citizenship, he speaks to his vision of interfaith harmony at places like the Clinton Global Initiative, The Nobel Peace Prize Forum, as well as college and university campuses across the country. He is a regular contributor to the Washington Post, USA Today and he Huffington Post. Patel, Eboo. Sacred Ground: Pluralism, Prejudice, and the Promise of America (Beacon Press, 2012). Patel, Eboo. Acts of Faith: The Story of an American Muslim, in the Struggle for the Soul of a Generation (Beacon, 2010). Ramadan, Tariq. Islamic Ethics: A Very Short Introduction (Oxford University Press, September 2016). The concept of 'ethics' involves the choice between what is 'right' and what is 'wrong', but no exact equivalent of the word 'ethics' exists in the Arabic language. Instead, the Arabic terms used to describe ethics cover a whole range of complimentary teachings with regard to concepts such as dignity, justice, and equality, about which Islamic legal scholars, thinkers and mystics have by no means always agreed. In this Very Short Introduction Tariq Ramadan examines the traditional contents of Islamic ethics and the dominant objectives of Islamic teachings. Analysing new approaches which are currently making their appearance, he shows how the ethical considerations of Islamic ethics are not far removed from those central to the Jewish, Catholic, Protestant and even Buddhist traditions. Ramadan, Tariq. To Be a European Muslim (The Islamic Foundation, 2015). To Be a European Muslim addresses some of the fundamental issues born of the several million strong Muslim presence in Europe in our times. Based on a thorough study of Islamic sources, it seeks to answer basic questions about European Muslims' social, political, cultural, and legal integration. 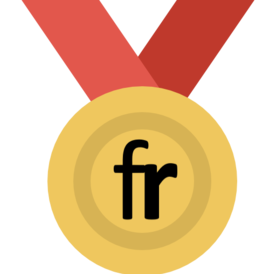 Tariq Ramadan is recognized worldwide for his original scholarship. He is a professor of Islamic studies at the University of Oxford and was named by Time magazine as one of the one hundred innovators of the twenty-first century. Ramadan, Tariq. Islam and the Arab Awakening (Oxford University Press, 2012). One of the most important developments in the modern history of the Middle East, the so-called Arab Spring began in Tunisia in December 2010, bringing down dictators, sparking a civil war in Libya, and igniting a bloody uprising in Syria. Its long-term repercussions in Egypt and elsewhere remain unclear. Now one of the world's leading Islamic thinkers examines and explains it, in this searching, provocative, and necessary book. Time Magazine named Tariq Ramadan one of the most important innovators of the twenty-first century. A Muslim intellectual and prolific author, he has won global renown for his reflections on Islam and the contemporary challenges in both the Muslim majority societies and the West. In Islam and the Arab Awakening, he explores the uprisings, offering rare insight into their origin, significance, and possible futures. As early as 2003, he writes, there had been talk of democratization in the Middle East and North Africa. The U.S. government and private organizations set up networks and provided training for young leaders, especially in the use of the Internet and social media, and the West abandoned its unconditional support of authoritarian governments. But the West did not create the uprisings. Indeed, one lesson Ramadan presents is that these mass movements and their consequences cannot be totally controlled. Something irreversible has taken place: dictators have been overthrown without weapons. But, he writes, democratic processes are only beginning to emerge, and unanswered questions remain. What role will religion play? How should Islamic principles and goals be rethought? Can a sterile, polarizing debate between Islamism and secularism be avoided? Avoiding both naive confidence and conspiratorial paranoia, Ramadan voices a tentative optimism. If a true civil society can be established, he argues, this moment's fragile hope will live. Ramadan, Tariq. In the Footsteps of the Prophet: Lessons from the Life of Muhammad (Oxford University Press, 2009). Ramadan, Tariq. Islam, the West and the Challenges of Modernity (The Islamic Foundation, 2009). Winter, Tim. The Cambridge Companion to Classical Islamic Theology (Cambridge University Press, 2008). This series of critical reflections on the evolution and major themes of pre-modern Muslim theology begins with the revelation of the Koran, and extends to the beginnings of modernity in the eighteenth century. The significance of Islamic theology reflects the immense importance of Islam in the history of monotheism, to which it has brought a unique approach and style, and a range of solutions which are of abiding interest. Devoting especial attention to questions of rationality, scriptural fidelity, and the construction of 'orthodoxy', this volume introduces key Muslim theories of revelation, creation, ethics, scriptural interpretation, law, mysticism, and eschatology. Throughout the treatment is firmly set in the historical, social and political context in which Islam's distinctive understanding of God evolved. 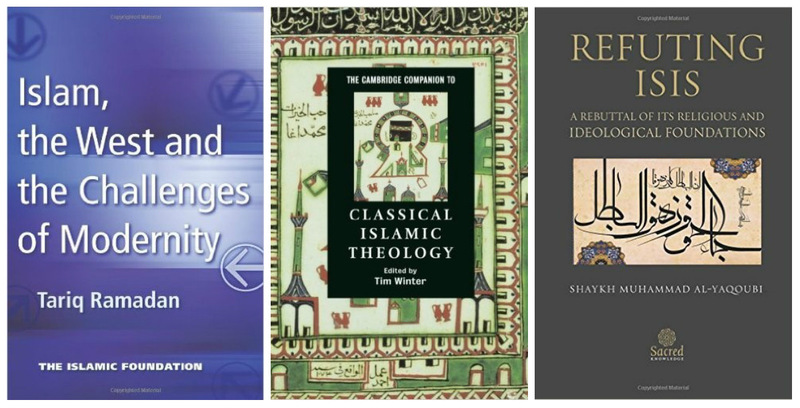 Despite its importance, Islamic theology has been neglected in recent scholarship, and this book provides a unique, scholarly but accessible introduction. Al-Yaqoubi, Shaykh Muhammad. Refuting ISIS: A Rebuttal Of Its Religious And Ideological Foundations (Sacred Knowledge, 2015). The Islamic State in Syria and Iraq (ISIS) constitutes the most serious threat Islam has ever faced. To justify its horrible crimes and appeal to Muslims around the world, ISIS has based its ideology on a superficial and literalist approach to the Sacred Texts of Islam - the Holy Qur'an and the Prophetic Tradition. ISIS manipulates religion to brainwash angry young Muslims, who have little knowledge of Islamic theology and jurisprudence. Therefore, the Muslim scholars are obliged to respond with a counter-narrative that elucidates the reality of Islam and its commitment to tolerance. There exists a plethora of proofs that demonstrates ISIS’ actions do not represent Sunni Islam and its claims are based on clear fallacies. The author, Shaykh Muhammad Al-Yaqoubi, a renowned scholar and one of the 500 most influential Muslims in the world today, presents in this invaluable book a thorough refutation of ISIS’ beliefs and crimes. Providing authentic quotes that destroy the allegations of ISIS, Shaykh Al-Yaqoubi reaches the conclusion that this group does not represent Islam, its declaration of a caliphate is invalid, and fighting it is an obligation upon Muslims.